DanceWorks: You will be featuring excerpts from past works such as Tarana, Avatar (9), and the CanAsian Dance Festival commissioned-work In My (Dis)Place, along with a new commissioned group work entitled Paratopia. You say “the word ‘Paratopia’ connotes innovation and synthesis”. Are the separate works in Paratopia connected for you? How have the various elements and dance styles informed each other? Bageshree Vaze: The word paratopia is actually translated as ‘displacement,’ but is a coined term based on a number of interpretations. I learned about the concept from a scholarly dance article written by Anurima Banerjee, in which she describes paratopias of performance in relation to Indian classical dance. The idea is that a paratopia is a place of alterity, one which can exist alongside mainstream culture, and can be both a reflection and a reaction to it, resulting in innovation and synthesis. Banerjee describes modern-day Indian dance performance as creating an ‘alternate’ world, and it made me think about how Indian dance, while perceived as traditional, is constantly defining its identity in a new time and place. Indian classical dances first originated in very unique settings of temples and royal courts, but found themselves thrust onto the modern stage in the mid-twentieth century. They weren’t necessarily created for this environment, but have now become shaped by modern production values and audiences. Contemporary dance practice in the Western world has evolved in a similar way, as a reaction to what existed before, and one sees the parameters of the dance practice evolving with each decade. In a sense, we are all trying to define ourselves in our changing ‘paratopia’ reality. The separate works in Paratopia are connected in this way, in that while they depict different parameters of Kathak dance, they have all been created with this vision of a new place and time. They are choreographic works that draw from the essence of Kathak technique, but were created in Canada, with different mentors and collaborators from non-Indian backgrounds. I think it’s a great reflection that the whole notion of what ‘contemporary’ means is changing and being re-interpreted, even though ironically, what people perceive as ‘contemporary’ dance has become quite traditional and solidified. For the new work involving artists trained in other styles such as urban and contemporary dance, we are using Kathak rhythmic and movement language as the choreographic base, but trying to open up more movement possibilities drawing from these different techniques. DW: You write that “people think of Kathak dance as traditional, but it is very contemporary, and evolves everyday.” What excites you most about the evolution of Kathak dance in your own practice? BV: There is no reason not to think of Kathak as contemporary – what we identify today as its signature technical qualities were defined in the 20th century, probably the same time frame in which contemporary dance was codified. But because Kathak originates from a very ancient, non-Western culture, people will naturally think of it as traditional. There is also the perception of Indian culture as ‘exotic’ because of the association with mythological characters and Hindu gods and goddesses, and much of the storytelling in Indian classical dances depicts this element. 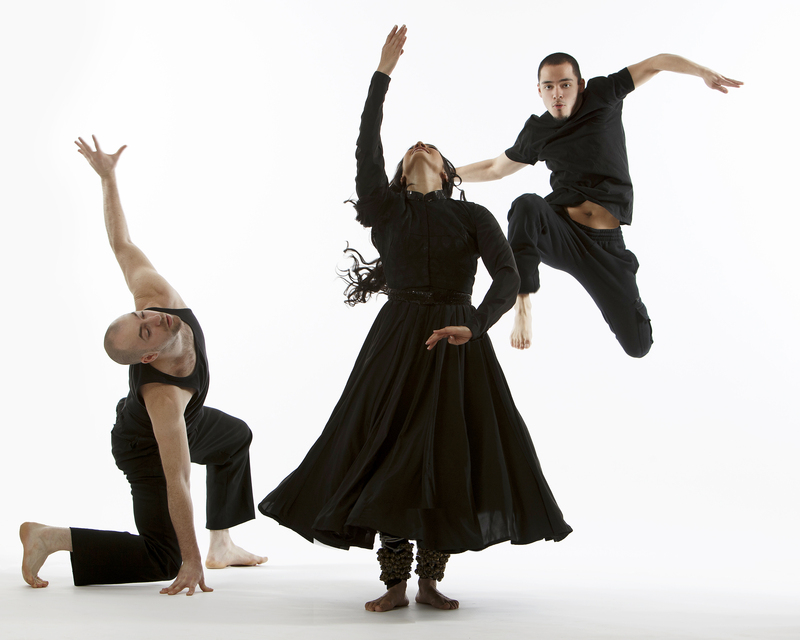 DW: Your website says “Inspired by The Matrix movies (which were inspired by Indian philosophy), Paratopia combines Kathak rhythms and dance with Urban/Hip Hop beats and choreography.” What was your process for integrating ideas, images or themes from ‘The Matrix’ into dance? BV: The Matrix is really a starting point for inspiration. The movies are based on the idea of the world as an illusionary place, one that is not real. This comes from the Hindu philosophical concept of ‘Maya,’ in which humans must navigate through an illusionary world. This made me think of the connection to Paratopia, and the idea that we are experiencing an alternate reality that is constantly changing and being displaced, and it is often difficult to determine what is real and unreal. The agents in the Matrix are metaphors of how people are not supposed to stray from homogeneity, and the battle of human life is finding a balance between resistance and harmony. We now live in a globalized, Internet-connected world where ‘homogeneity’ is constantly being questioned and re-interpreted. So the new work will draw from this idea of using a ‘code’ to navigate through an alternate world with different bodies and languages to determine what reality actually can be with co-existing opposition and agreement. You won’t see battling agents in suits or airbending (well maybe a little bit), but rather a dance piece that is based on Kathak and Tabla rhythmic ‘code,’ and drawing from a base of rhythmic beat language one finds in both Kathak and urban dance choreography.